Evolving from wolves some 18,000 years ago, dogs have always held a special place in our hearts. They may be from the same species, but dogs come in all shapes and sizes and have developed unique traits that set them apart from one another based on where they evolved and the purposes they were originally bred for. Today, the UK is home to a variety of dog breeds and their mixes, from spaniels and retrievers, to terriers and hounds. Of course we have our favourites but, generally speaking, our modern preferences are fairly encompassing. That said, regional factors still play a big part in the types of dogs we favour. This has always been the case throughout history, with a focus being on developing and improving certain types of dog to fulfil the needs of different communities and cultures. 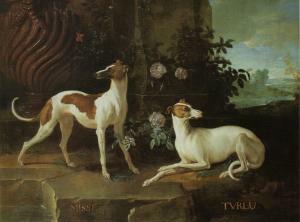 At some time or other there were breeds that simply didn’t exist, while others ruled supreme in every corner of the region. So, let’s go back in time and look at the types of dog that were popular then and now, from as far back as 3100 BC, right up until the 21st century. For the extended versions of this article, check out Dogs through the Ages: Part 1 and Part 2.